Town of Middle Franconia, Bavaria, situated on the Tauber, 41 miles west of Nuremberg. Jews must have been settled there as early as the beginning of the twelfth century, since a Jew of Rothenburg is mentioned in a Würzburg document of 1119 (Aronius, "Regesten," p. 100). There are also isolated notices concerning Jews in Rothenburg and dating from the end of the twelfth and from the thirteenth century. Thus, in the year 1180 the Jew Samuel Biscoph of Rothenburg bought from Count Eckard a place adjoining the foundation of St. Killian, for which he was to pay to the church 8 pounds of wax annually on St. Killian's day (July 8; Aronius, l.c. pp. 133-135); and in 1251 King Conrad IV., for 3,000 marks in silver, mortgaged the town of Rothenburg, with the Jews in it ("Rothenburgum et Judæos"), to Gottfried of Hohenlohe, to cover the many expenses which the latter had incurred by being in the king's service (H. Bresslau, in "Hebr. Bibl." x. 129; Wiener, "Regesten," p. 8, No. 41). In the middle of the fourteenth century Rothenburg again became the possession of a stranger, when the emperor Charles IV. bestowed the whole town, together with the Jewish school, cemetery, and houses, on Bishop Albrecht of Hohenlohe, at Würzburg, and at the same time released the magistrates of the city from any oaths or obligations which bound them to protect the Jews. But the town, which at that time was in a condition of growing prosperity, due in part to the Jews, was not disposed to permit the latter to be systematically oppressed by the bishop and taken before the ecclesiastical courts. Consequently complaint was made to Charles IV., who invited the bishop, with both Christian and Jewish representatives of Rothenburg, to a council at Nuremberg. Before that took place, however, the city released itself from its connection with the bishop; on Sept. 30, 1353, the Jews came again under the jurisdiction of the town council, and from that time on were not claimed by the emperor. Nevertheless they were required to pay certain taxes directly to the king; and Opferpfennig receipts for the years 1393, 1394, and 1395 have been preserved, given to Rothenburg Jews in the time of the emperor Wenzel by the latter's favorite Borziwoy of Swynar. The Jews appear to have paid other taxes besides this, for two of the receipts designate the sums received as "Jew taxes." The opferpfennig from Rothenburg alone amounted to 75 gulden in 1409, under the emperor Rupert. It was still collected in Rothenburg under Sigismund, but when Emperor Maximilian I. also demanded it (Sept. 17, 1504) the Jews refused to pay it, in which refusal they were upheld by the city. After this the payment of the opferpfennig by the Jews of Rothenburg is no longer mentioned. At the time of the Black Death there originated in Rothenburg the so-called Shepherd Brotherhood's day, which was celebrated annually with great pomp on Aug. 27, in memory of the escape of the town from poisoning by the Jews. The story runs that an "otherwise simple" shepherd stated before the magistrates that he had seen the well Hertrech, at the upper Galgenthürlein, poisoned, and that he had overheard a conversation on the subject carried on by Jews in Hebrew, and wished to save the town. On the strength of this charge the burghers were warned not to draw water from the well in question, and the Jews of the town and vicinity who had not already fled were thrown into prison and tortured. If a Jew desired to be admitted to the city, he had first to make out an application bearing his signature in Hebrew, and present it to the council, in return for which he received from the latter a permit with the municipal seal affixed. These permits were for permanent settlement as well as for temporary residence. In especially difficult cases the council gave aid to its Jewish burghers. Thus, in the dispute which Master Mendel of Pappenheim,for unknown reasons, had with the Nuremberg Jewish burghers Isaac and Feyfelin, Mendel having put the burghers under the ban (1383), it was decided that each of the parties concerned should advance 1,000 gulden, and that the victor in the dispute should take the whole sum. According to Bensen ("Beschreibung und Gesch. der Stadt Rothenburg," p. 521) and Merz ("Rothenburg in Alter und Neuer Zeit," p. 93), the Jews were banished from Rothenburg in 1397 and were denied admission to the town until 1404. At the time of banishment the council sold the synagogue and Jewish dance-hall for 2,000 gulden to the burgher Peter Creglinger, who built on the site of the synagogue a chapel to the Virgin. In 1414 the knight Erkinger of Sausheim was entrusted with the collection of certain money (comp. Keller, "Zur Gesch. der Besteuerung der Juden Durch Kaiser Sigismund und König Albrecht II." 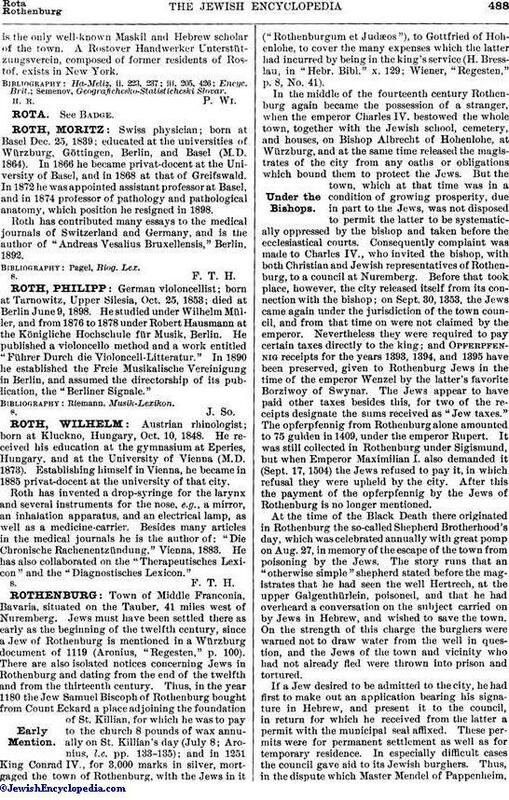 in Geiger's "Zeitschrift für Gesch. der Juden in Deutschland," iii. pp. 301-336). On his arrival the council arrested all Jews in the town, including among them strangers temporarily in Rothenburg on business. Archbishop John of Mayence interposed in vain on their behalf; they were all kept under arrest until they had paid the required sum of 2,000 gulden, for which Sigismund himself signed the receipt (Oct. 8, 1414). In order to raise the money they borrowed from the town council, binding themselves to pay it back in weekly instalments. The Jews of Rothenburg were especially oppressed by the small princes. Thus on May 2, 1422, Bishop John of Würzburg issued an order to the pastor of Rothenburg which made the following demands upon the council: (1) the Jews were to be prohibited from practising usury; (2) they were to wear on the breast a cloth badge, of red or other color, one span long and one wide, so that they might be distinguished from Christians; (3) a Christian might neither rent nor sell a house to a Jew; (4) a Christian might not serve a Jew for hire; (5) debts due from Christians to Jews were to be paid to the bishop; (6) other moneys and treasures were to fall to the council. The council demanding an extension of the time allowed before the order should come into force, the bishop granted until July 7, 1422. In the meantime the king came to Nuremberg, and since at that time he was himself planning to tax the Jews the decree of the bishop was revoked. Nevertheless, the regulation in regard to wearing distinctive signs appears to have been enforced, for in 1511 the Jews asked the council how the new badges should be made. Another extraordinary imperial tax was imposed in 1433, when the Rothenburg Jews had to pay Sigismund a coronation-tax of 200 gulden, in return for which, on April 14, 1434, they received an imperial privilege releasing them from all taxes for ten years. Maximilian was the first emperor to interfere in Jewish affairs, the occasion being the general assembly summoned by the Frankfort Jews, on Nov. 6, 1509, in order to secure harmony in decisions. The assembly met with little success, principally through the ostentatious reserve of the Rothenburg delegates, who at the request of the Augsburg Jews were urged even by the emperor to act in concert with their fellows, but with no effect. About eight years later the Rothenburg Jews themselves had occasion to appeal to the emperor, when (1517) a demand was made upon the council of Rothenburg by the robber-knight Klaus Wolgemuth that the Jews should be compelled to pay him a certain sum of money. Thereupon the Jews received a privilege from the emperor (July 7, 1517) permitting them to refuse to submit to such extortions. But in spite of privileges they could not prevent the council from voting, on Nov. 7, 1519, a decree of banishment. It is remarkable, however, that according to the records they were banished at their own request, repeated by the "Schulklopfer" Michel only a few days before the passing of the decree. When the emperor asked the reason for the request the council answered that the preachers, especially Dr. Teutschlin, had stirred up the people against the Jews, that the council could not protect them, and that when stones were thrown at the Jews the latter had asked to be formally banished. The truth of this, however, does not appear to be proved, for from another record it is learned that the Jews complained of Teutschlin's activity and petitioned the council not to listen to his in vectives and not to banish them. When the decree of banishment was issued they received the right to collect any money due them, without interest. But the people, not satisfied with this, went to the jurist Dr. Steinmetz for advice, who, although very reserved, allowed interest already paid to the Jews to be deducted from the principal. Before the time set for their departure the synagogue was plundered of all its treasures. On Jan. 8, 1520, there were only six families left in the town; these left Feb. 2, following. 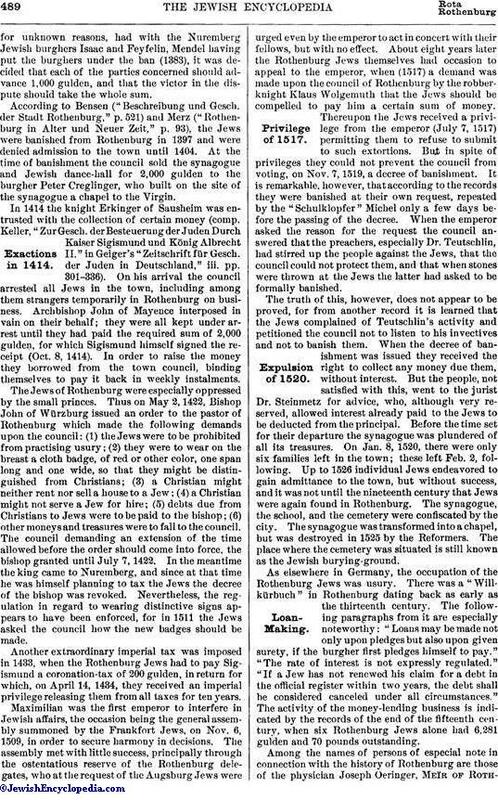 Up to 1526 individual Jews endeavored to gain admittance to the town, but without success, and it was not until the nineteenth century that Jews were again found in Rothenburg. The synagogue, the school, and the cemetery were confiscated by the city. The synagogue was transformed into a chapel, but was destroyed in 1525 by the Reformers. The place where the cemetery was situated is still known as the Jewish burying-ground. As elsewhere in Germany, the occupation of the Rothenburg Jews was usury. There was a "Willkürbuch" in Rothenburg dating back as early as the thirteenth century. The following paragraphs from it are especially noteworthy: "Loans may be made not only upon pledges but also upon given surety, if the burgher first pledges himself to pay." "The rate of interest is not expressly regulated." "If a Jew has not renewed his claim for a debt in the official register within two years, the debt shall be considered canceled under all circumstances." 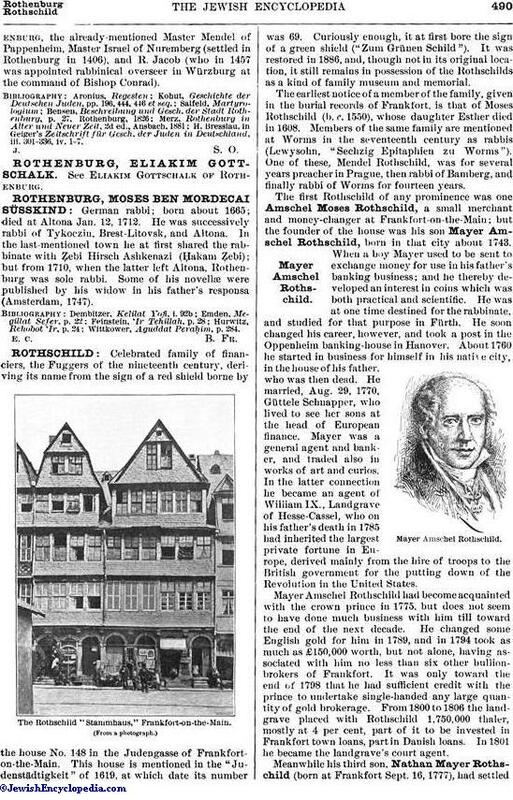 The activity of the money-lending business is indicated by the records of the end of the fifteenth century, when six Rothenburg Jews alone had 6,281 gulden and 70 pounds outstanding. Among the names of persons of especial note in connection with the history of Rothenburg are those of the physician Joseph Oeringer, Meïr of Rothenburg,the already-mentioned Master Mendel of Pappenheim, Master Israel of Nuremberg (settled in Rothenburg in 1406), and R. Jacob (who in 1457 was appointed rabbinical overseer in Würzburg at the command of Bishop Conrad). H. Bresslau, in Geiger's Zeitschrift für Gesch. der Juden in Deutschland, iii. 301-336, iv. 1-7.